How many Olympians have there been? You’d think that one of the easier questions for us to answer would be: “How many Olympians have there been”? This simple question is actually quite hard to answer. We do have an answer, of course, but it’s also definitely wrong. An Olympian is an athlete who has been accredited to participate in the Olympic Games in a full medal sport. This is a useful starting point: it explicitly names athletes (so no coaches, doctors, team leaders, etc.) and also excludes competitors in demonstration sports (which have not been held since 1992), exhibitions (last held in 2008) and other side-events. However, the “accredited” part of the definition is a bit less useful for us. Among accredited athletes are of course those who eventually compete, but also those who fail to start for any reason (injury, disability, left off the team) or are only brought on a substitutes. In some sports, there are even various levels of accreditation. For example, in football (or soccer if you prefer), each team is nowadays allowed to enter 18 players, which are allowed to stay in the Olympic Village. However, if one of these gets injured, they are allowed to replaced them by one of four players on a separate list. Many of these alternate players don’t actually go to the Olympics, but they do have an accreditation. It seems to us that being present at the Olympics would be a minimum to qualify as an Olympian. The 18 Mexican football players that were handed an Olympic gold medal in London 2012. We could then, of course, use that criterion to decide who is an Olympian. But this is pretty hard. Finding entry lists or accreditation lists is one, but these never say if a person was actually in town or not, which means we would have to figure this out for each athlete personally. And not just for recent years, but also for entrants from 1896, making this a virtually impossible task. An Olympian is an athlete who has competed in the Olympic Games in a full medal sport. But that definition still isn’t complete. What exactly is a full medal sport? And what are Olympic Games, even? Turns out that you can debate about both. While the Olympic Games of the modern era are pretty well-known, there’s an odd-one-out: the 1906 Intercalated Games in Athens. While organized and approved by the IOC at the time, the IOC later decide not to recognize these Games as official – despite their importance to the Olympic Movement. Many Olympic historians disagree with this view, and so do we, so we include these Games in our figures. Ray Ewry won a total of 10 Olympic gold medals, including two at the 1906 Intercalated Games, which are not currently recognized by the IOC. Regarding the full medal sports, there is also debate about the early Olympics. In 1900, the Olympics were held in conjunction with the sports events at the World Exposition in Paris. Many events did not use the predicate ‘Olympic’, despite the fact that the we consider them to have been part of the Olympics. Four years later, when the Olympics were a side-show of yet another major exhibition (the Louisiana Purchase Exposition), the organizers did the opposite, and labelled every sporting event “Olympic”, including e.g. track and field championships for elementary school boys from St. Louis, handicap races, and other competitions hardly word the predicate “Olympic”. 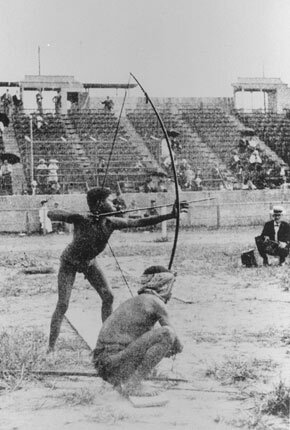 One of the more shameful “Olympic” events in St. Louis were the Anthropology Days in St. Louis, were so-called ‘savages’ competed against one another. This gives a list that excludes many of the fringe events held in these years, but is also slightly longer than the one used by the IOC. Moving forward in time, there’s another category of events that qualified as full medal events at the time they were held, but that are often omitted: the art, aeronautics and alpinism competitions. From 1912 through 1948, Olympic medals were awarded in art, and between 1924 and 1936, medals were also handed out in alpinism and aeronautics. These medallists are not found on the IOC website, but they definitely received medals, which is why we include them as well. Now, we do have to say that this number is – sadly – wrong. Records books of the Olympics aren’t always complete, and we know for certain that many athletes are missing. For example, the members of the Greek gymnastics teams in 1896 have so far never surfaced, and neither have the names of the art competitors in 1920 that didn’t win a prize. In some cases, we do even know the number of athletes that we’re missing, but we don’t know if these are all “new” Olympians or not. Even for more recent Olympics, information on who competed isn’t always clear-cut. In handball, all players on the team are listed on the match roster, even if they didn’t play. For recent years, detailed substitution information is available, but this is lacking for earlier years, leaving us to rely alternative sources such as video footage, contact with the athlete in question, etc. Some of the 128,420 Olympians during the opening of the 1964 Olympics in Tokyo. Apart from missing data in the sources, we are of course only human, and therefore make errors. For example, we recently figured out we had missed two substitutes in the 1964 4-man bobsled competition (although both were already known as Olympians) – even though this information was in the Official Results. To compensate for that, we sometimes unearth information that isn’t even in the Official Results. For example, last year, we found out two missing divers in the 1960 women’s diving event, and an hitherto unknown substitute in the 1920 water polo match Brazil – Sweden. So, it is with full confidence we can say that 128,420 is the wrong number. But we dare you to come up with a better one! His statement on balloons is true for hot-air balloons. But it is not true for the balloons used from the 1790s to the 1950s. Gas balloons were certainly used in the 2nd Olympic Games. They were standard because they used no heat sources, heat sinks, or motors and were more practical, until modern technology emerged. So it seems there should be some more Olympians, who ventured hundreds of kilometres away from Paris in their events.